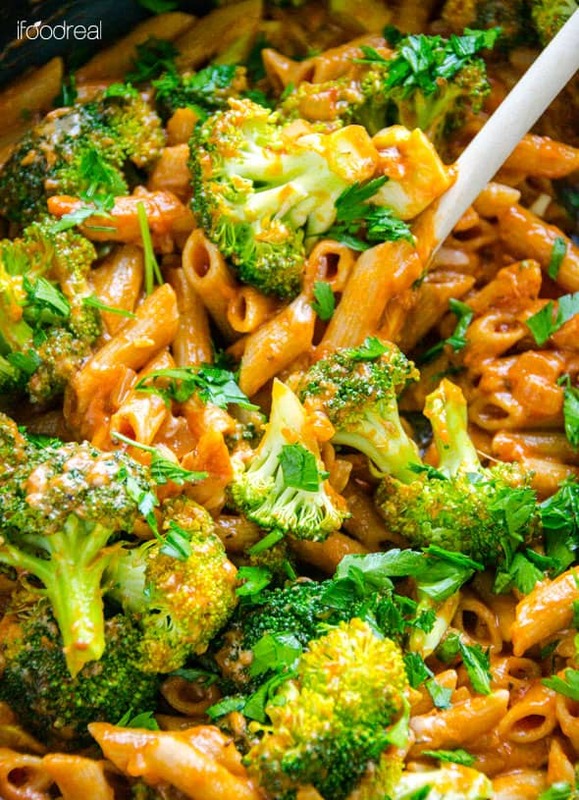 This penne with broccoli is my-go-to 20 minute dinner for kids when my fridge is empty and they won’t eat my quinoa skillet. It’s affordable, quick, healthy and versatile – use any firm veggies you have on hand/your kids like. Frozen vegetables work too. Oddly enough my kids love broccoli, not over cooked. Cauliflower, carrots and snap peas are great options as well. You could also add grape tomatoes, peas and corn, why not?! I added only 3/4 cup cheese, just enough to make the dish creamy and cheesy. Dried and fresh herbs, tomato sauce and good quality pasta take care of the rest. This dish was creamy and delicious. 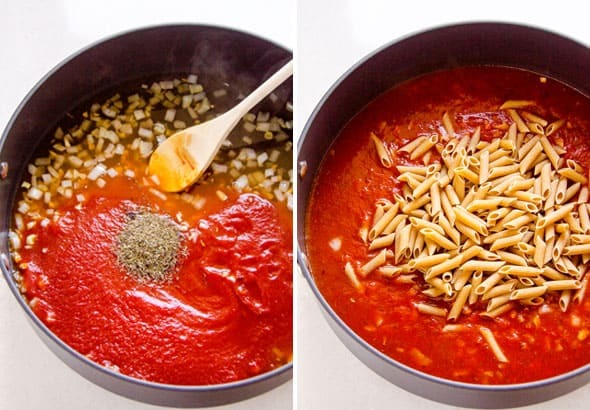 Sauce consists of onion, garlic, thyme, salt, pepper and tomato sauce. Pasta cooks right in the skillet. That’s right, just add water. If it gets too thick the next day, add more boiled water. I always have it in my kettle. Isn’t it beautiful?! 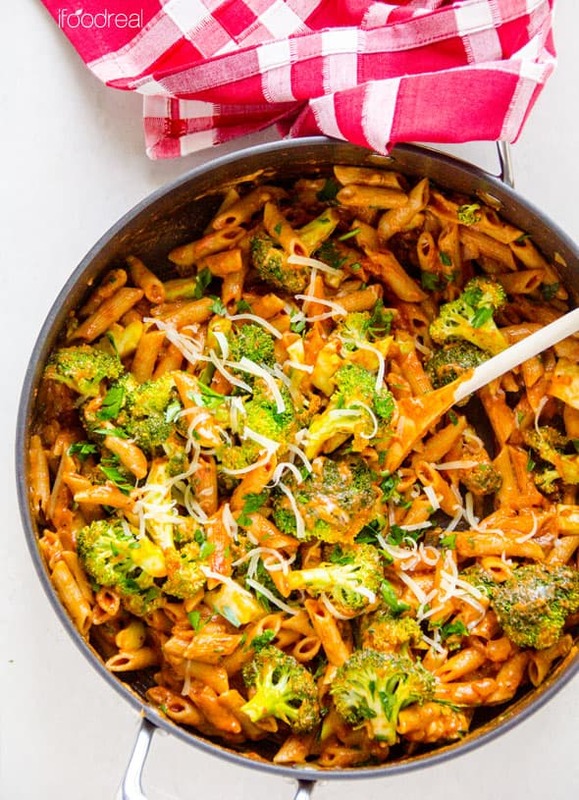 After pasta is cooked, add your vegetables of choice and cheese. We like cooked but still crunchy broccoli but you can increase cooking time for softer vegetables. 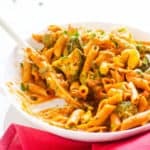 This penne with broccoli makes plenty with leftovers to be taken for lunch the next day or frozen. Super simple, isn’t it?! 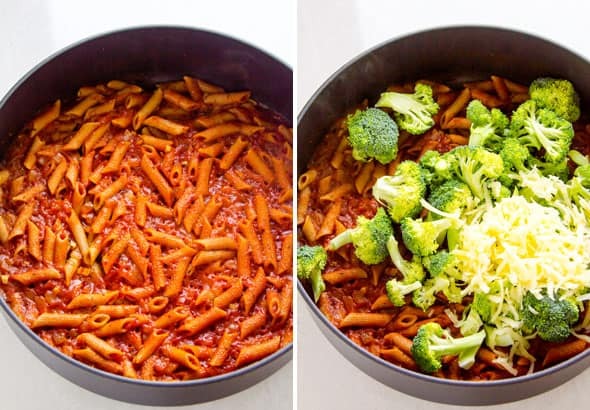 Penne pasta with broccoli, tomato sauce, garlic, onion and oil cooked in one pan and topped with cheese for an easy healthy dinner recipe. Preheat large deep skillet on medium heat and add olive oil, onion and garlic. Saute until translucent, stirring occasionally. Add tomato sauce, water, thyme, salt, pepper and stir. Add pasta and stir again. Bring to a boil, cover, reduce heat to low and cook for 15 minutes. 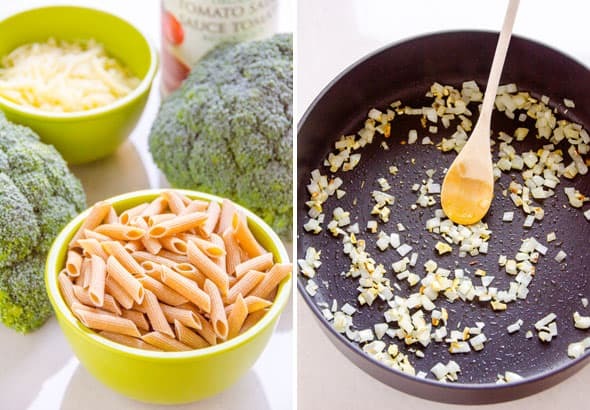 Add broccoli and cheese, cover and cook for 3 minutes for crispy broccoli and 5 – 6 minutes for softer vegetables. Remove from heat and adjust thickness of the sauce with extra boiled water (I use water from a kettle). 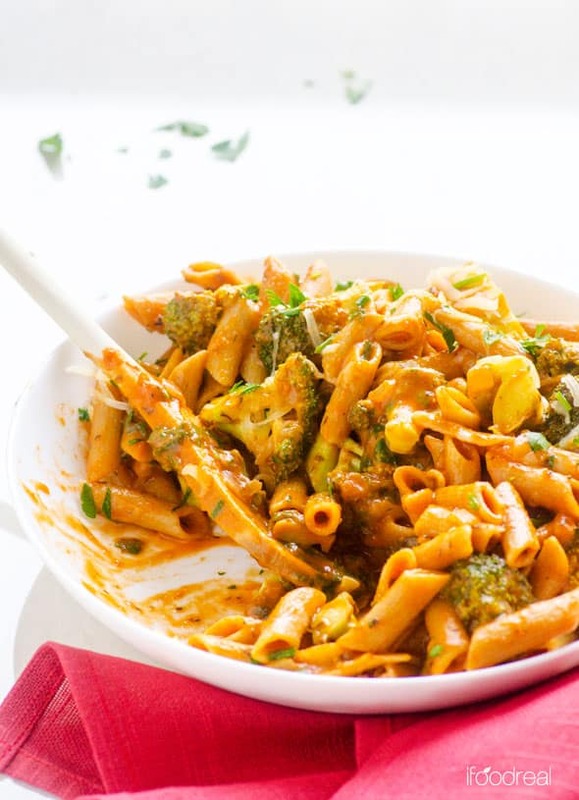 You can do this at any time since pasta tends to soak up the sauce, especially the next day. Garnish with parsley or basil and serve hot. Store: Refrigerate covered for up to 3 days. Freeze in an airtight container for up to 3 months.